Am I cheating on my first love? My new relationship, with Baking and Pastry class, is not leading to early relationship euphoria. Quite the opposite. Read why, at my blog's new location: www.sfgate.com. 15 days, 27 breads and pastries; can we do it? Ambitious to say the least is Chef Richard's production plan for us in the first three weeks of Baking and Pastry class. Read about it at the new location of my blog, at the San Francisco Chronicle's Website, www.sfgate.com. Now that we're into Baking and Pastry at culinary school, the issue of weight gain is again before us. Read about it in my blog's new locale, SFGate. My daily blog entries are moving. Effective today, Feb. 15, read them at SFGate's City Brights. Today's blog post -- LEADING WITH MY THUMB -- introduces me and my blog to what I hope will be a wider audience. There's room for you there, too. If you have been following me here, please link to SFGate. Eighteen weeks of cooking classes ended on Thursday, giving us a pretty complete going-over of the basics of classic French cuisine. Now comes the hard part for me, starting on Monday. "How long do you cook a cake?" 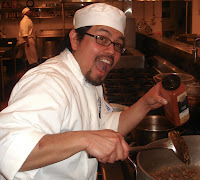 Chef Instructor Richard Sanchez asks rhetorically. "You don't 'cook' a cake, of course. You 'bake' a cake." That's new territory for me, and I enter with trepidation. I am not a baker. The good news is that Chef Richard seems more than willing to start with the basics. For example: "The first thing you will learn is to say 'baking,' not 'cooking'." Say, maybe this won't be so bad after all! We will learn to make a chocolate butter cake, Chef Richard promises. We also will learn to bake bread and make croissants and a host of other delectables. Frankly, baking and pastry making have never been part of my attraction to the kitchen; my preference has always been for the savory side. But the territory we covered in cooking classes was far beyond anything I expected, opening my mind to all possibilities. The newest frontier beckons. I stand ready, whisk in hand. How does he keep his slender figure? 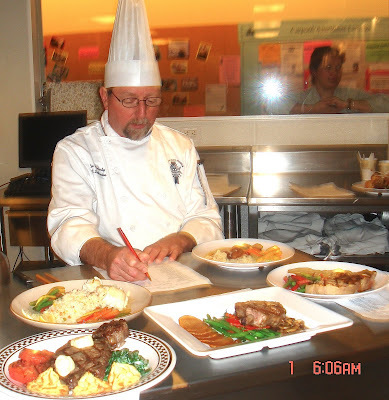 Chef Dan Fluharty scores final platings from five students in Culinary Foundations III. This plating was worth 50 points. Chef tasted each component to score doneness, seasoning, temperature, appearance and portion size. He also scored each plate overall on food color -- minimum of three colors required for full credit -- cleanliness, design and height. 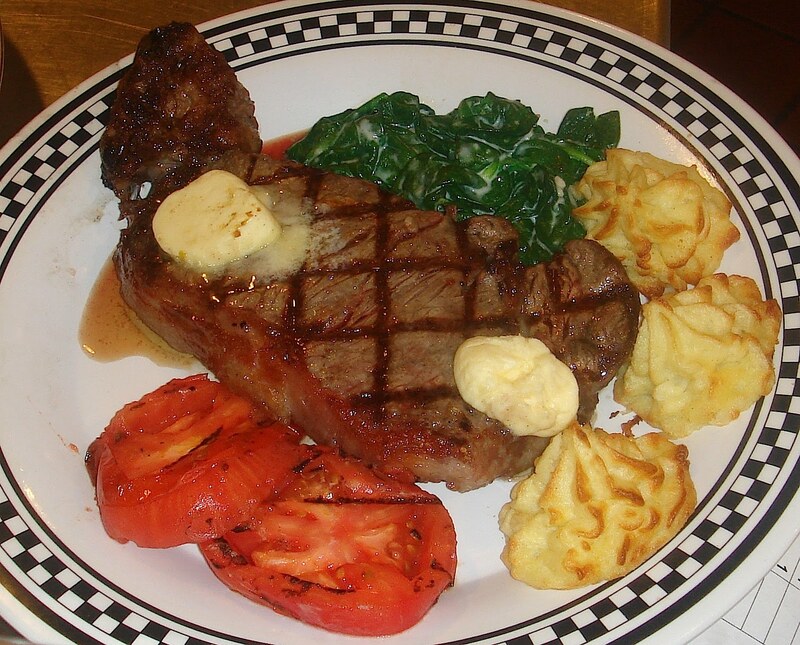 The rectangular plate in the center and the round plate on the far right are grilled pork chops; the plate nearest Chef's left hand is sauté of duck breast; the plate near his right hand is fillet of sole and salmon mousseline; the plate in the lower left is mine, grilled New York steak. 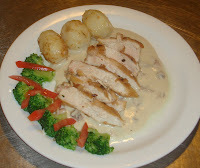 Sauté of boneless chicken breast over a mushroom sauce suprême, broccoli florets in a butter sauté with julienne of tomato, potatoes tourné. 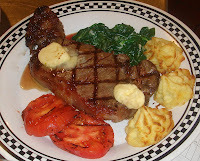 Grilled New York steak with roasted garlic compound butter, creamed spinach, pommes duchesse, grilled tomato slices. "Those were some scary sharp knives." -- Culinary student John Briggs after the class viewed a video in which an experienced butcher broke down a side of beef in quick time. "He always has such off-the-wall questions." "And, I've got lots more." -- Exchange between Chef Dan Fluharty and culinary student Alfie Regadio (left) during a review session for final exams. -- Chef Dan Fluharty critiquing our less-than-stellar performance in making breakfast potatoes. "Parsley and lemon sauce; it's from a cook book." -- Culinary student Jorge Olmos to Chef Dan Fluharty when Chef asked him about the sauce he was planning for his final exam chicken dish. "Remember the day we made chicken ballotine?" "That was my worst day yet." -- Chef Dan Fluharty reviewing our cooking, with culinary students Molly Lester and John Briggs reacting. Journalist writing about food, cooking and eating. Studying for a certificate in culinary arts at the California Culinary Academy, a Cordon Bleu affiliated school in San Francisco. NEWS FLASH: ¡Que Aprovecho! goes downtown! Final exam plating: Can I make it 'suprême'? Why do chefs wear the tall hats?